For future reference the Wikitravel:CIA World Factbook 2002 import can be found at Talk:Thailand/CIA World Factbook 2002 import. 20 Thailand is the gay friendliest country in Asia. 31 Huge city template for islands? 34 Still Rated as an Outline? I went ahead and did it. Basically I followed the layout of the weather maps in the local newspapers. There seems to be some question about whether or not they are really needed. I won't be bothered either way. Regions? Yes, or no? Red Bull actually is an original Thai drink (Krating Daeng is actually "red water buffalo" and the logo is exactly the same). In 1987 an Austrian businessman named Dietrich Mateschitz made a deal to introduce the product worldwide, and tweaked the formula (taste and carbonation). The original Thai company owns 52% of the new Red Bull which is based in Austria. As the Red Bull site states, the Austrian guy came across the original Krating Daeng in Thailand and remarketed it as Red Bull. The company is joint-owned by Austrian and Thai concerns. I've lived in Thailand throughout the 1980's and know that Kratingdaeng was widely sold long before Westerners became familiar with it. Lipovitan D was the first of those kind of drinks. Then came Kratingdaeng, and then there were big advertising wars between Kratingdaeng and Magnum, with each brand trashing one another in "redneck" television commercials. Magnum took a blow when one of their chief endorsers, champion boxer KhaoKor, fainted in the ring during a fight with a Korean. Although these "stamina" drinks originated in Japan (and possibly the Japanese got the idea from somewhere else), Kratingdaeng, literally "bull that is red" and the famous charging bulls logo is absolutely Thai in origin. I have drank it in the early 1980's, definitely before the formation of any Austrian Redbull company. All these kinds of drinks were typically working class drinks. Truck drivers, taxi drivers, factory workers, etc. all imbibed them in prodigious quantities. The upper classes of Thailand would avoid these drinks, looking down on them as "redneck" beverages. I think there's been a general shift from "Koh" to "Ko" with publications over the last few years. Berlitz use "Ko" (not sure if that's for maps or books or both or what). Thai people are more likely to write "Koh"; non-Thais are more likely to write "Ko". "Ko" is more common in Thailand on signs, buses, boats, advertisements, in magazines, etc. "Koh" gets more google hits (the actual ratio varies a lot between different islands - no idea why). "Ko" is currently more common at wikitravel.org - despite the actual article names. Neither "Ko" not nor "Koh" is likely to inspire a non-Thai to pronounce the word anything like Thais do; however "Ko" tends to produce something shorter sounding (but usually still not short enough). If you rename the main articles, I'll take care of the links, redirects, etc. BTW "Ko(h) Pha Ngan" is more common than "Ko(h) Phangan" or any other variation. Updates to links / redirects / etc now done. The seven articles that need renaming are the seven islands listed in Thailand#Other_destinations - all Koh -> Ko, except Koh Phangan which should be changed to Ko Pha Ngan. I live in Thailand and have to say that the sound of Ko in Thai is the same sound as the UK 'got' without the t, but with a low tone, since it is a short syllable. Just FYI, the best English approximation would be "goh" It is clearly a ก which is a "g" sound and a short, high oh, similar to "aw". I realize no one will change from Ko or Koh but for those who want to pronounce this correctly, try "Goh"
I'm in Maesot. The Friendship bridge to Myanmar has reopened, and I believe all other borders are as well. Can someone else confirm, so the warnings can be removed. Pai is a very popular destination in Mae Hong Son province. It is well known and popular with Thai people, Chinese tourists, as well as something of huge magnet for Farang (western) tourists. Emergency number in Thailand are 191 (Police), 199 (Fire Fighter). Re: removed racist reference to caucasians - it's extremely unrealistic to dismiss the term "farang" as offensive or unacceptable, and removing it from Wikitravel articles because it's racist is a mistake. One item of importance is the widespread use of "farang" by Thai people, referring to Western visitors. Foreigner is much more inclusive and includes Japanese, Chinese, Africans who do not fit into the term "farang" for Thai people. As a foreign visitor, you are not expected to know how to wai, nor to reciprocate when wai'd to; while you're unlikely to cause offense if you do, you may well look slightly ridiculous. Thailand is very relaxed and I want to add here that if the situation is casual, looking "slightly ridiculous" might be just right. Also, anything related to the stories and movies The King and I and Anna and the King is illegal to possess in Thailand. Almost all Thais, even ones in other countries, feel very strongly when it comes to any version of this story. The second sentence above that Thais feel strongly is certainly true. My 84 year old Thai mother in law just about broke the arms of a chair in my living room when she saw Yul Bryner jumping around "like a monkey" in the King & I on TV. However, the reports that the videos are actually banned may be urban legend. I think it needs to be checked with the Thai embassy. I recall reading in the english language press in Thailand about the time when Jodi Foster version of Anna & the King came out that the daughter of the king had seen the film and was not displeased with it. First of all, to clear the misunderstanding about the content, this article is copyright of TAT and this page has got content from  page. Yes -- you've added way too much info, 99% of which is blatant touting, and I've reverted the whole lot. There is no consensus that this level of medical info is appropriate anywhere on Wikitravel. I think the beer section seems quite out of date, so I propose re-writing it if people agree with my proposed changes. I think Singha Light, Chang Draught and Chang Light all warrant a mention in the Thai beers section; and San Miguel, Asahi and Federbrau are now commonly available upmarket brands. In fact, it may be better to split the section up into "Local brews", "Upmarket Brands" and "Imported Beers", the latter including the increasingly common Belgian Beers (Duvel, Stella Artois and Hoegarden all easy to find now, especially anywhere tourists might find themselves), Beer Lao and Irish ales such as Guinness and Killkenny, also well established on the tourist trail. Finally, the biggest anomaly that should definitely be corrected if nothing else is the mention of Kloster - a beer which has been discontinued in Thailand for many months now. Thailand is the gay friendliest country in Asia. There should also be some mentino of the lady boys as there are alot of them about, especially in Bangkok. They can be a bit unnerving at first, if you aren't aware. Great work to get the ball rolling with this discussion GT. I have long thought Thailand to be an absolute WT mess, right from the overly complex regional structure down to almost every important article being ruined by that horrible data dump from the tourist board. I do know Thailand quite well and will try to help with some insights later today. Can we get rid of all brackets in the region names? They lead to very confusing article names. Sub-central Thailand I would just call Central Thailand. Loose Koh Chang Peninsula and just call it Trat. 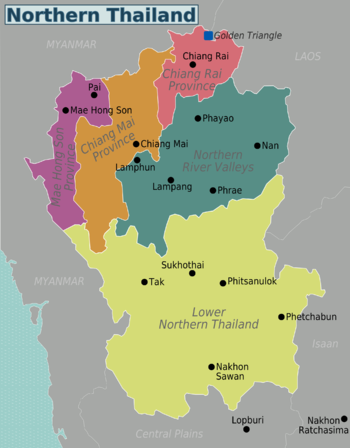 For the north I would go for Far North Thailand and Inner North Thailand. Not very elegant but I cannot think of better. I think you are OK with 3 Isaan divisions. I also don't like the brackets, so they should be avoided. The problem with "Gulf Coast" is that it is confusing, as there is a part of it in the South and in the East. I propose we rename them Eastern Gulf Coast and Southern Gulf Coast. Big problem is the Deep South, as apparently there already is a Deep South in the United States. That's why I used the brackets there. I tried naming it Deep Southern Thailand, but I'm not sure if that sounds nice. I agree with calling it Trat, but the city also has the name Trat, so we should call it Trat Province. Agree with the north, sounds good. Also agree with the notes about Isaan and Eastern Thailand. Try to integrate the info in the Understand, Get In and Get Around sections of the Province into the same sections of the cities. The See, Do, Learn, Buy and Sleep sections have a different approach. These listings are not useful for travellers, they are just a dump from the Thai tourist agency (TAT). To not mess up the current articles, it's best to move them to the Talk page for future reference. I like the regional scheme I presented, but two regions seem to need further subdivisions as they have plenty of content: Far Northern Thailand and the Andaman Coast. Subdividing these units is quite a challenge though, as small specific areas are filled with content, while usually the areas around it are empty. This is also a problem in Southern Gulf Coast, as for example Ko Pha Ngan is already in practice functioning as a region. Not sure what to do with that. Please give your comments about the sub-divisions underneath, and also some ideas what to do with the Southern Gulf Coast. Maybe anyone has a better idea? 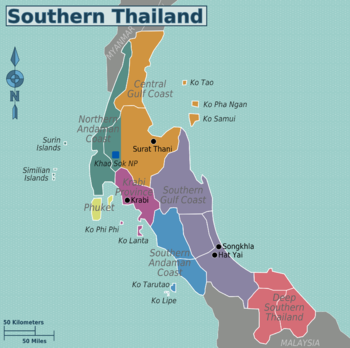 The regional structure of most areas are quite straightforward, but Southern Thailand has so much content, it's definitely an exception. How shall we divide this region? The Gulf Coast and Andaman Coast are logical subdivisions, but then both would still have way too much content. Liking that, the only thing i'm not entirely happy about is the name for "Nothern Golf Coast", I think it's best when we can work out names that doesn't only work in regional context, and there is plenty of golf coast up north. Although I can see where you are coming from, as I have trouble thinking up a suitable name too. Hi - let's have a section on recommending the best 5 or so movies to watch to understand Thailand. They often do that kind of thing in Lonely Planet guides and I find it very useful. Also Books too. Huge city template for islands? Taken from the Bangkok page under the "stay safe" banner(I have modified it to suit the entire country) this information might be good on the Thailand page as well? Elephants are a large part of Thailand's tourist business, and the smuggling and mistreatment of elephants for tourist attractions is a widespread practice. Be aware that elephants are often separated from their mothers at a young age to be cruelly trained under captivity for the rest of their lives. If you must go on an elephant ride, purchase an elephant painting or use elephants for other activities please take their mistreatment into account. A depressingly common sight on the congested streets of tourist centers is elephant begging. During night hours, mahouts (trainers) with lumbering elephants approach tourists to feed the creatures bananas or take a photo with them for a fee. The elephants are brought to the city to beg in this way because they are out of work and are mistreated and visibly distressed under the conditions of the city. Please avoid supporting this cruelty by rejecting the mahouts as they offer you bananas to feed the elephants. Due to its location, lax laws, and resources, many illegal animal products come through Bangkok. Rare and endangered species are often sold at markets for pets (especially at Chatuchak), and many other animal products are sold as luxury items. Avoid buying rare pets, leather, ivory, talons, dried sea creatures (such as starfish), fur, feathers, teeth, wool, and other products since they are most likely the result of illegal poaching, and buying them contributes greatly to animal endangerment and abuse. Drugged animals such as lizard's and birds are somtimes used by touts as photo subjects. These touts are often seen on the main tourist beaches of thailand. The tout will take a photo with you and the doped up animal for a fee. Still Rated as an Outline? This page was last edited on 2 November 2017, at 14:03.